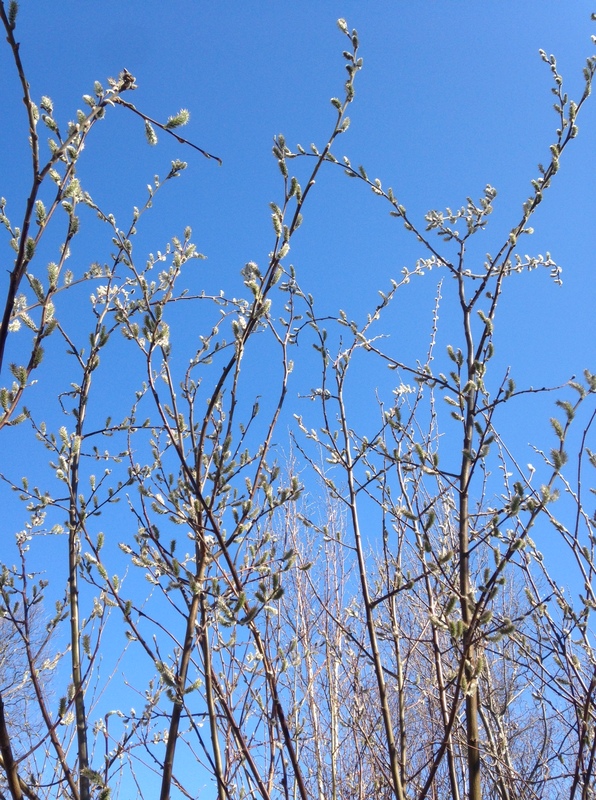 In many parts of the country, I expect the trees are already green, the flowers have sprouted, and temperatures are generally above 70F most days. Here, however, we’re looking at high temps just barely cracking 60F, but that still means summer is coming! – if a little early. In another few days the trees will be green. I’m not going to embellish here, it feels fantastic, it also poses a major problem for me and for any progress I was hoping to make, in spite of being in sight of having draft one of book one finished. It’s just too nice to be inside for anything not involving grabbing a drink or yelling at the kids to go outside. Today, in particular, I had a hard time even thinking about writing. I spent the first two hours of the day mucking about with social media and drinking coffee. Then, I went outside, hauled my daughter off to dance class, got some reading done, and fantasized about the yard-work that I’m totally going to probably do this summer if I’m forced to. I really didn’t bother coming back in until quarter to eight, except to grab a beer. The only reason I’ll be getting any writing done this summer is that it gets cool and buggy later in the evening, and it’s easier to be inside. Anyone have strategies for writing in the summer? – or should I just not bother, and do whatever? Summer is basically the reason I don’t have a complete novel written. 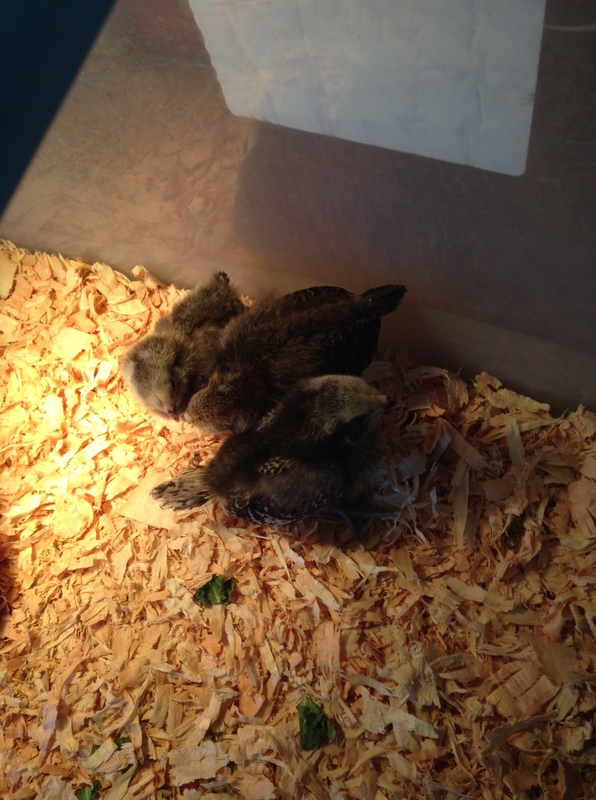 Also, here’s a picture of the chicks my wife said she wasn’t going to bring home. I had one sleeping in my fleece vest while I wrote this post. This entry was posted in rubber-ducking, writing, writing process. I think at least a half-hour of writing a day is a nice touch, but sometimes even that’s hard in summer. Those chicks and their chicks. So, lemme see if I understand the story: The author is trying to publish a book. That’s his GOAL. But during summertime, he also feels compelled to go do other stuff because it’s summer. That’s the CONFLICT. This has the beginnings of a good book. We need an antagonist and a story arc. The Author’s hidden flaw is that he’s a fellow who wants to enjoy life to its fullest. Even as he goes out gold mining, with his burro and trusty daughter in tow to make him sourdough pancakes in the Yukon territory, he is wracked with guilt that he should be writing. His daughter begs him to return home so she can stop cooking and eating pancakes every day. One day, he finds a humongous gold nugget, but feels like he sacrificed writing his book for the nugget, so he must decide whether to keep the nugget and give up all semblance of publishing the book (it’s a blood nugget), or to throw away the allure of gold panning and go back to writing his novel? Dump the chickens out of the story… unless they get a character arc, too. Ok, so far so good… I’d recommend swapping out Yukon territory for someplace in Alaska (just a personal and completely irrational bias), I vote Chicken, AK (google this it is a legit. mining town) – it also sorts out the issue with the chicken, instead of being a character, it’s a place yay! Interior Alaska / Yukon territory is an excellent setting. wide rolling hills covered in the remains of decades old forest fires only just now showing signs of recovery. Rivers teeming with every manner of fish, wild herds of caribou numbering in the tens of thousands. Daily thunderstorms, whipping up just around 4:30pm to clear in time for a 7pm ballgame (okay, that’s Fairbanks, Chicken is too little for baseball – the weather is for real though) This was good exercise, now I’m thinking about writing again, except it’s about a fictional miner in Alaska who had left Maryland a decade ago to bask in the wilderness and write his novel, but got distracted by the lures of shiny lumps of wealth hidden beneath the unforgiving landscape. Also, just so you know, I seriously considered posting a picture of myself and daughter gold-panning, but it’s like a 20 minute drive, and I just felt super lazy so… Anyhow, I’m back to it! My goal is 1000 words tonight. Excellent. I threw in the Yukon because I knew it wasn’t Alaska. I studied the YGR a few weeks back because the 7 y.o. is interested in gold mining and I was wondering when the Alaska gold rush happened, which lead to the Yukon gold rush and all that, and it’s Canada. I never drew the lines that the Yukon territory was Canada — I’ve heard it mentioned hundreds of times in Bugs Bunny cartoons and in passing in culture, but no one has ever come right out and discussed it like a fact. Isn’t this really about habits? So you make a habit and stick to it and if you do it long enough, you persevere and you overcome. The novel won’t write itself. The writers who successfully publish (I didn’t say they were successful in the sense they sold anything, that’s another ball of wax) write prolifically. You’ve already hit your 100 k words, so you’ve got the discipline, but lock down some habits for the summer so you get in a few pages a day.